I have been waiting to unveil this room for quite some time now. 🙂 So far, it is my favorite room in the house. 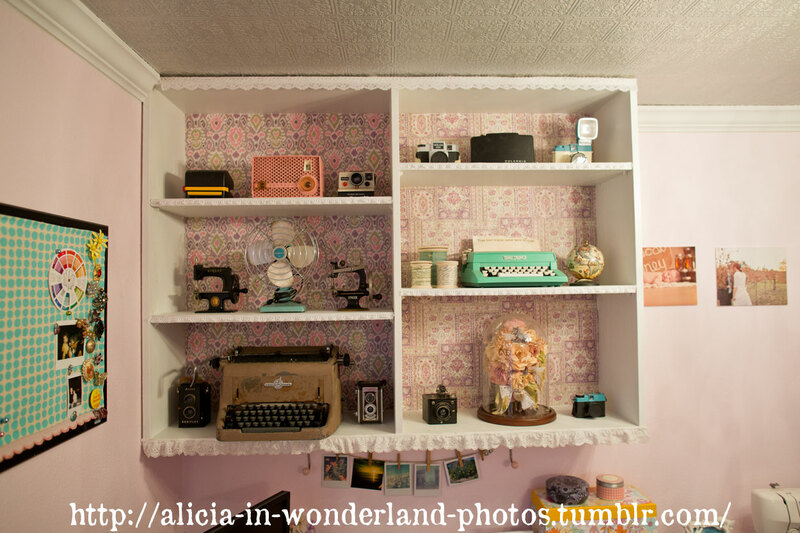 I can make things as pink and girly in here as I want with no complaints from anyone else. 😉 There were a lot of projects that went into creating this room. You can read about the ceiling here, my custom cabinet knobs here, my DIY lampshade here, my fabric covered bulletin board here, and the flooring fiasco here. You can also see the before pictures here. My office is bedroom #4 in the before pictures (also last used as an office). I used the same two desks that we had in our old rental house (seen here), but I wanted a more cohesive look. I primed and painted the two desks a matching shade of “fig” purple. I painted the floor a gray with a hint of purple, and found two pinks that I love for the walls and built-in cabinets. This room has tons of storage closets with shelving and drawers which works perfectly for all of my craft supplies, camera gear, photo props, etc. When we moved in, the previous owners left behind their built-in “desk” and wall cabinet. The very haphazard desk had to go, but I decided to find a way to spruce up the open wall cabinet. I painted it all white, glued vintage laces to the edges of the shelves, and added two types of pretty printed shelf liner paper to the back of the cabinet. I went with shelf liner paper since I didn’t want to buy a whole roll of wallpaper for such a small area. It was kind of difficult to match up the patterns along the seams, but I am so happy with the end result! This entry was posted in Home Improvement & Decorating Projects and tagged anthro, anthropologie, bohemian, boho, craft room, decor, decorating, diy, eclectic, home, home office, office, projects, remodeling, studio, thrifted, thrifting, vintage. Bookmark the permalink.